Front Porch Digital has announced updates to its DIVAdirector media asset management (MAM) system, a permission-based Web application that enables complete access to file-based content stored by DIVArchive CSM systems. 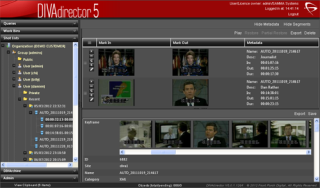 DIVAdirector V5.1 contains new features designed make it easier for any media organization with a DIVArchive system to manage its digital files, especially if that organization is using Front Porch Digital's LYNXsm platform for moving, archiving, and online video publishing to the cloud. Front Porch Digital DIVAdirector V5.1 Organization and Shot Lists"We've added new features and capabilities to this version of DIVAdirector that were critical to our new LYNX cloud-based offering," said Rino Petricola, senior vice president and managing director of Front Porch Digital International. "Cloud operations are going to dominate the industry, so we've developed version 5.1 to address LYNX-specific workflows and requirements such as site awareness, whereby a single DIVAdirector system can show the enterprise content view of assets stored in different archive systems, be they local, networked, cloud-based or any combination, with integrated user permissions controlling access." DIVAdirector V5.1, available as a cloud service or licensed locally, includes enhanced integration with other components in Front Porch Digital's DIVASolutions product line, including SAMMA for content migration, DIVAnet for managing multiple DIVArchive systems across a wide area network (WAN), and DIVApublish mpx for taking media to market.